Wacker Wacker supervisory board chairman Peter-Alexander Wacker holds a piece of ribbon over his head during a grand opening ceremony for the company's new $2.5 billion plant on Monday, Apr. 18, 2016, in Charleston, Tenn. Tennessee Governor Bill Haslam stands to his left, while Dr. Rudolf Staudigl (CQ), president and CEO of Wacker Chemie, stands to his right. Impurities in polysilicon are measured in parts per trillion, or the same as a single typing error in 1 million books of 1,000 pages each, according to Wacker. CHARLESTON, Tenn. — Wacker Chemie officials, marking the opening of their new $2.5 billion polysilicon plant in Bradley County, said Monday they're already looking at erecting an adjacent factory that builds on its sizable investment. 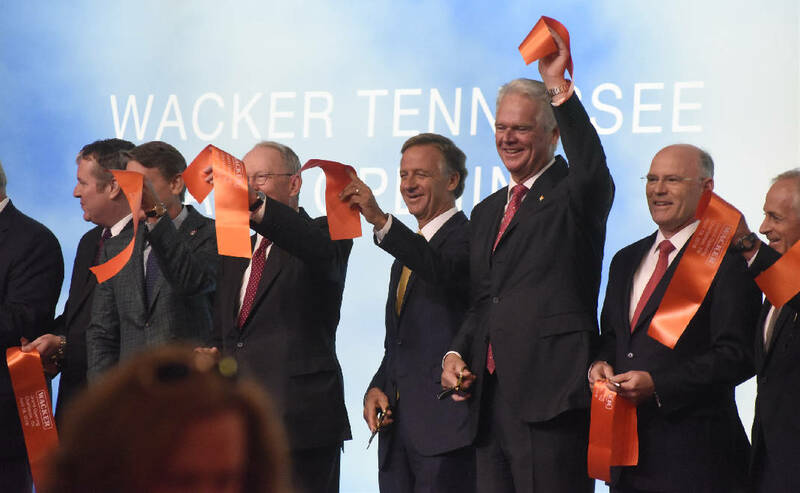 "We've come to Tennessee to stay," said Peter-Alexander Wacker, chairman of the German chemical company's supervisory board, at the grand opening of the sprawling polysilicon plant that is to employ about 650 people. Rudolf Staudigl, the company's CEO, said engineering studies have begun on building a $150 million pyrogenic silica factory at the site. Staudigl termed a second factory "the next logical step," though board approval is still needed and work would not start this year. He said about 50 workers would be employed at the second factory. Pyrogenic silica is a filler in silicone elastomer and a viscosity-adjusting agent in coatings, printing inks and adhesives. It also serves as a flow aid in the cosmetics, pharmaceutical and food-processing industries. Polysilicon is the raw material used in the production of solar power panels. A byproduct of its manufacture is tetrachlorosilane, which either is converted and fed back into the production loop or processed into pyrogenic silica. "As of today, the Silicon Valley starts in Tennessee," Staudigl told several hundred people who turned out at the Wacker site. Tennessee Gov. Bill Haslam said he would "love to see that additional growth" at Wacker, located about 40 miles northwest of Chattanooga. He cited the "incredible investment" made in the factory, noting company officials could have changed their minds on the project several years ago when the polysilicon market was soft. Wacker officials have said the polysilicon project represents the largest single private manufacturing investment ever in Tennessee or by the company. "It's a really big deal," Haslam said. U.S. Sen. Bob Corker, R-Tenn., mentioned the vision and courage of Wacker officials to proceed with the factory originally announced about seven years ago. The former Chattanooga mayor said there was no way the Wacker plant would have happened without low-cost power available from the Tennessee Valley Authority. Also, Corker said Wacker is facing tariffs on products sent from the United States to China. He said he intends to "continue to work to make sure the playing field is level." U.S. Sen. Lamar Alexander, R-Tenn., said solar energy is rapidly gaining more acceptance in America. He said solar energy accounted for 26 percent of newly installed capacity in the U.S. last year. "This is a significant step for Tennessee manufacturing when skilled Tennessee workers are being relied upon to manufacture some of the world's purest silicon," Alexander said. The plant will produce 20,000 metric tons of hyperpure polysilicon a year. Konrad Bachhuber, who heads the Charleston facility, said production startup of polysilicon has begun, but that it's a complex sequence of steps with the plant to go full bore in the third quarter. "You have to do it in a very controlled way to maintain this purity level," he said. Wacker, one of the world's biggest players in polysilicon, initially placed the plant investment at $1 billion in 2009 when the project was unveiled. In 2012, the company announced production would be delayed and it slowed the pace of construction. At the time, Wacker blamed changing solar market conditions and overcapacity for polysilicon. The average price for polysilicon in 2012 plunged by some 42 percent and struggled through 2013 before rebounding, according to pv magazine. Still, a recent report estimated that Wacker is receiving more than $200 million of tax breaks and assistance. Another Tennessee polysilicon plant that was under construction at the time in Clarksville, Tenn., owned by Hemlock Semiconductor, was built but never started production. Google has announced it's planning to build a data center at that site, investing $600 million and creating about 70 full-time jobs. Staudigl said the polysilicon plant's commissioning is "a great moment for our company." "In our opinion, the long-term business prospects for renewable energy sources and especially for solar energy are excellent," Staudigl said.